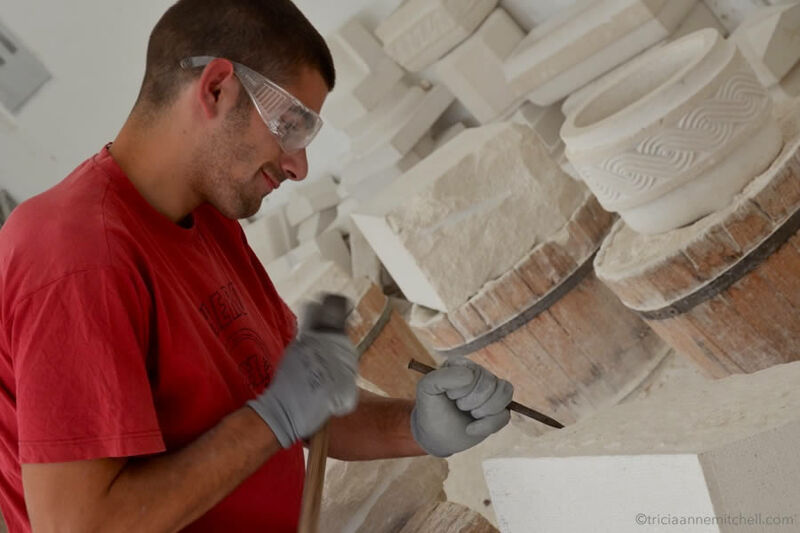 The Pučišća Stonemason School (Croatian: Klesarska škola) has trained students in the art of stonemasonry for more than one hundred years. Located on the rugged Croatian island of Brač (pronounced Bra-ch), in the sleepy town of Pučišća, the school currently has 79 students, two of whom are young women. While most of the students come from all over Croatia, there are also a handful from Bosnia-Herzegovina, and even the Czech Republic. 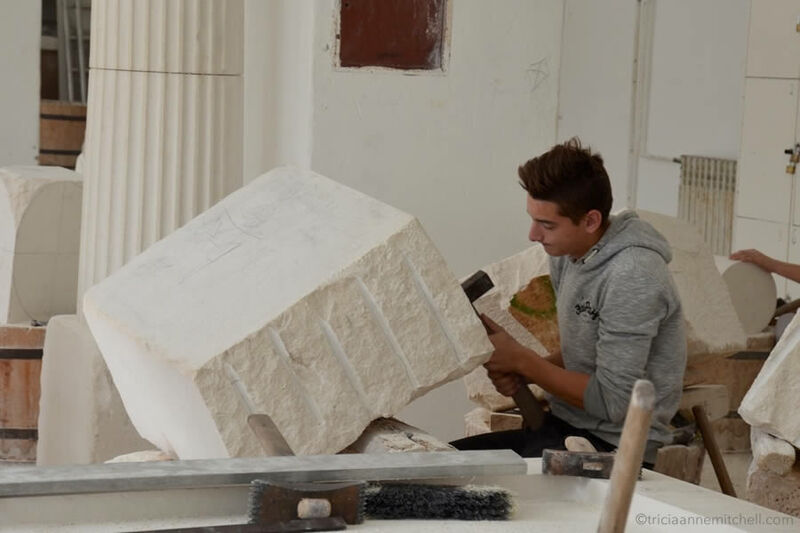 The students choose between three and four-year tracks, with one path leading them to become stonemason technicians, and another preparing them to be stonemasons. There’s even a dormitory and traditional classrooms inside the complex – spaces that Shawn and I accidentally discovered as we navigated the building in search of the main entrance. Not wanting to interrupt the students for too long, I asked some young men in the workshop why they’d decided to become stonemasons. One of the teenagers confidently took on the role of translator. “It’s beautiful, that’s why,” the young man said, gesturing to a partially finished window. 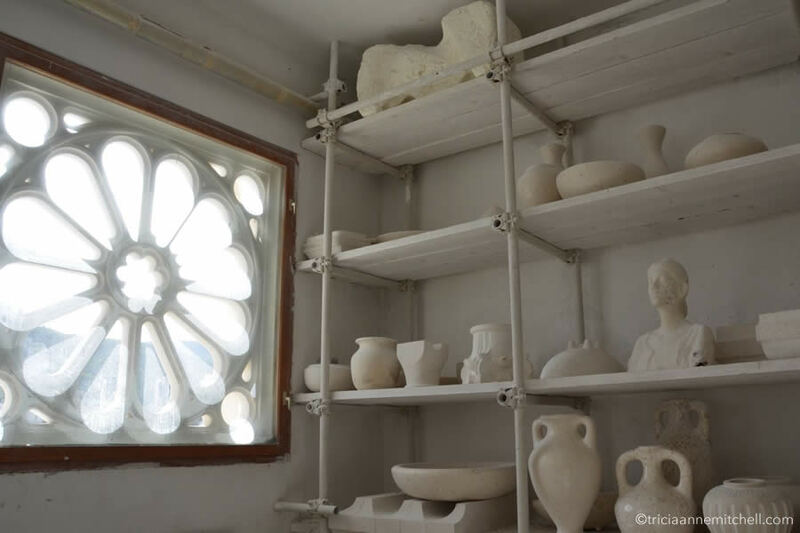 The frame he drew my attention to was delicate, white, and similar to windows I’ve seen on historic churches throughout Croatia and Europe. 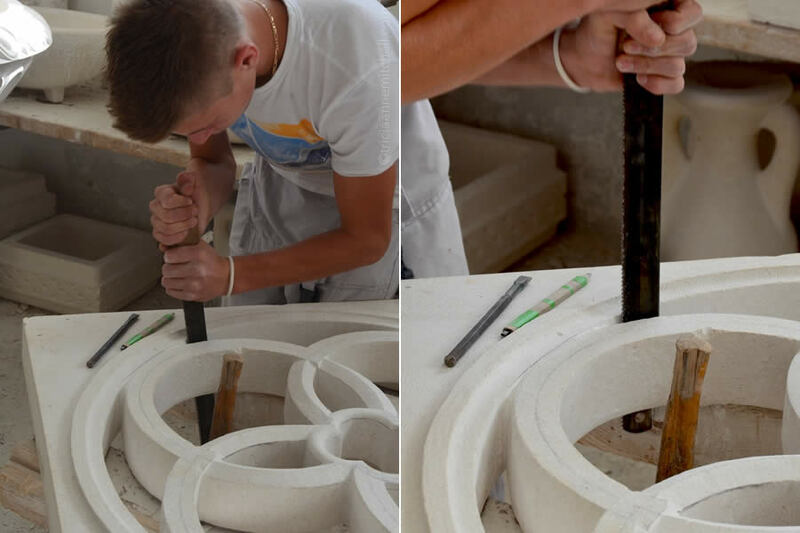 This similarity wasn’t surprising given the traditional techniques employed at this school, and that Brač’s stone has been cherished internationally for centuries. Incredibly, Brač limestone has been used to adorn parts of the White House in Washington, D.C., as well as parliament buildings in Budapest and Vienna. 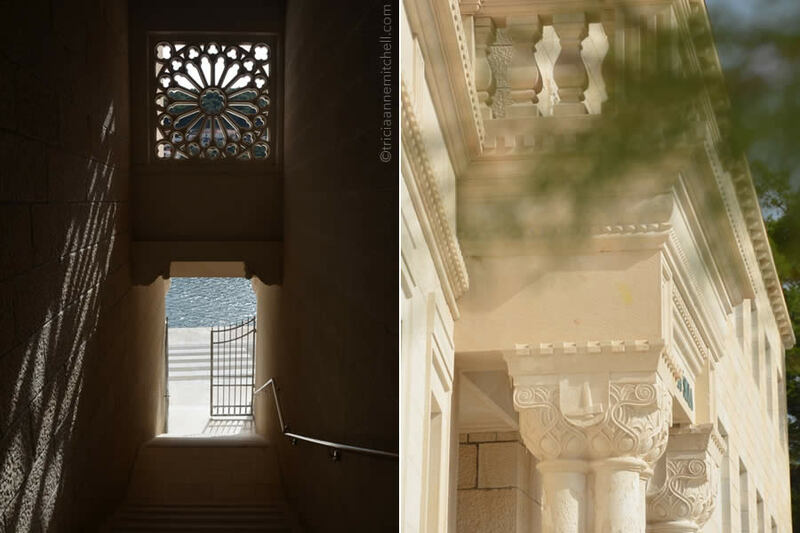 In Croatia, you can find Brač limestone showcased in UNESCO World Heritage Sites such as Diocletian’s Palace in Split, the Saint James Cathedral in Šibenik, and the Cathedral of Saint Lawrence in Trogir. There are numerous quarries on Brač. Some are still in use. While others, like the quarry used to source stone for Diocletian’s Palace, were abandoned centuries ago. As Shawn and I wove between the barrel-like workbenches, I was struck by the patience, passion, and attention to detail the teenagers devote to this art. With a plethora of electronic gadgets to distract them these days, coupled with their own coming-of-age challenges, I was impressed by their emerging talent and dedication. As we left the school, a trio of boys began teasing a classmate with a compressed-air gun intended to remove stonemasonry dust from clothes. In many ways, the students seemed less like future masters and more like typical teenagers – a forgivable condition considering that Michelangelo was probably the same way in his younger years. 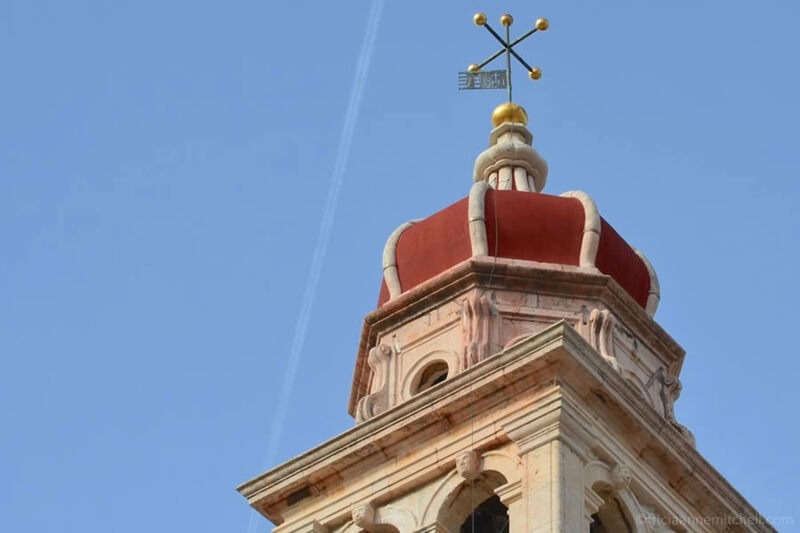 Pučišća’s pretty skyline is dominated by the bell-tower of the Church of St. Jerolime. It was built in the 1560s. The tiny town has a population of just over 2,000 people. 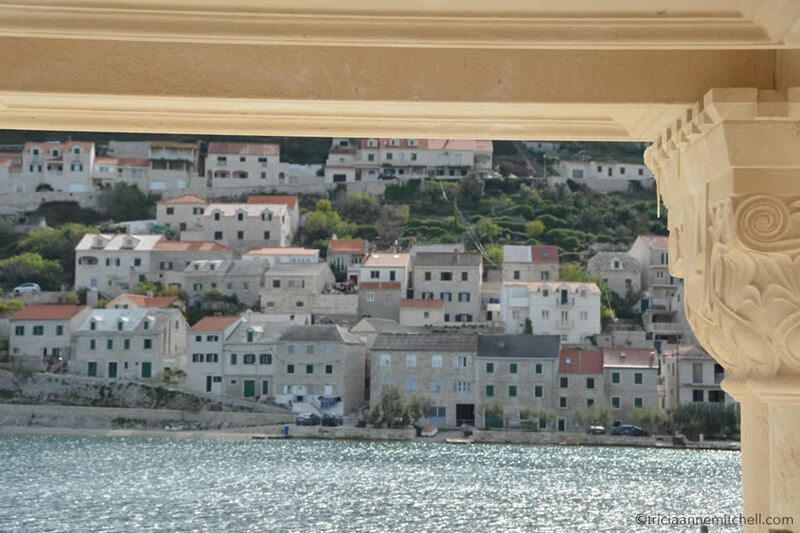 The town’s homes look like dollhouses when viewed from the other side of Pučišća’s bay. Just around a bend near the Stonemason School, you can catch a peek of the quarry from which limestone was sourced for the White House, as well as several European parliament buildings. You can find more on the White House claim here. Pučišća’s Stonemason School was founded in 1909. After visiting, I read that each year the school’s graduating class collaborates to create a new window frame for the school’s façade. This explains why the windows on the lower floors are ornate, while the upper levels look rather austere. Detail of the school’s entryway. Pučišća, as seen from the stairwell of the school. Detail of the windows on the front of the school. The school’s graduates go on to find work on Brač, and in Austria, Canada, and Germany. I think the United States could certainly benefit from the introduction of more skills-based educational programs like this. This pattern is called the Croatian Interlace (known as pleter in Croatian). It was a popular motif during the 9th to 12th centuries, and featured prominently in church and monastery architecture. 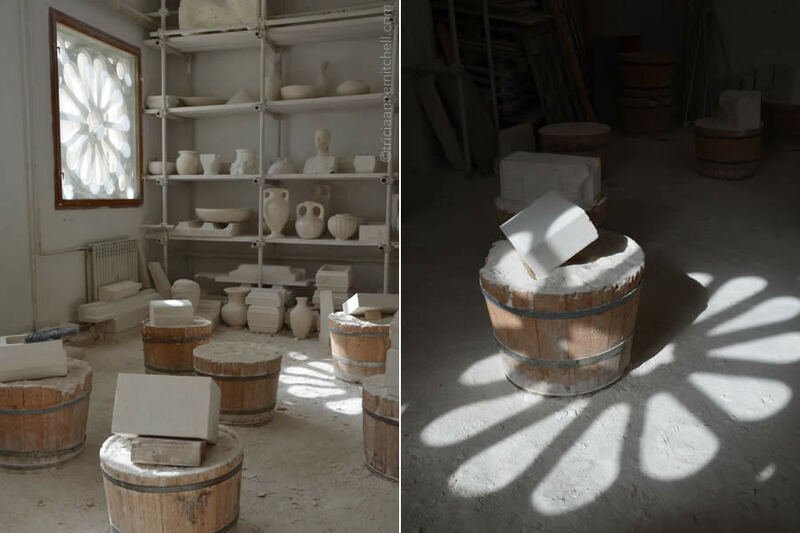 Sunlight floods into the workshop, casting snowflake-like shadows onto the dusty floor. I love the barrel-like workbenches. A student works on an intricate window. Another student said such a project might take about five months to complete if four students work on it, and potentially one year if someone works on it solo. Sleepy Pučišća’s main street. We enjoyed coffee at the corner café here, and this is the bus stop too. Graffiti on a landing not far from the school. 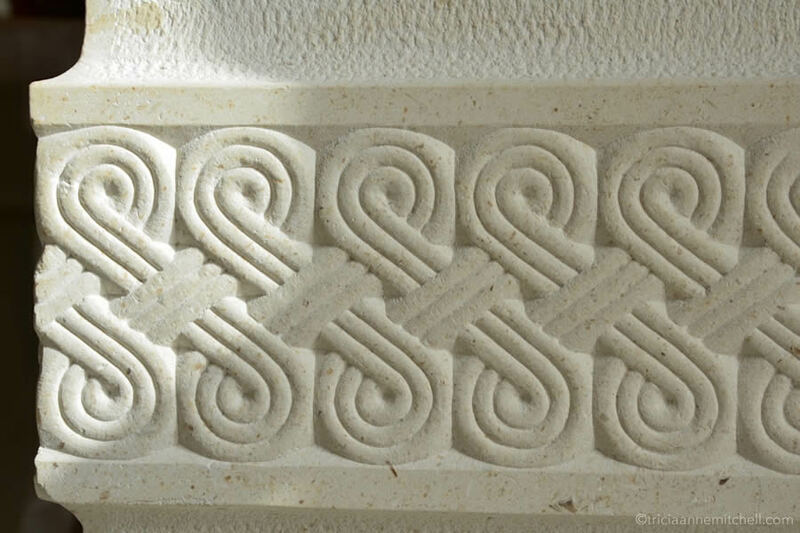 I wonder what the students and master stonemasons think of this lazy form of stone-carving? 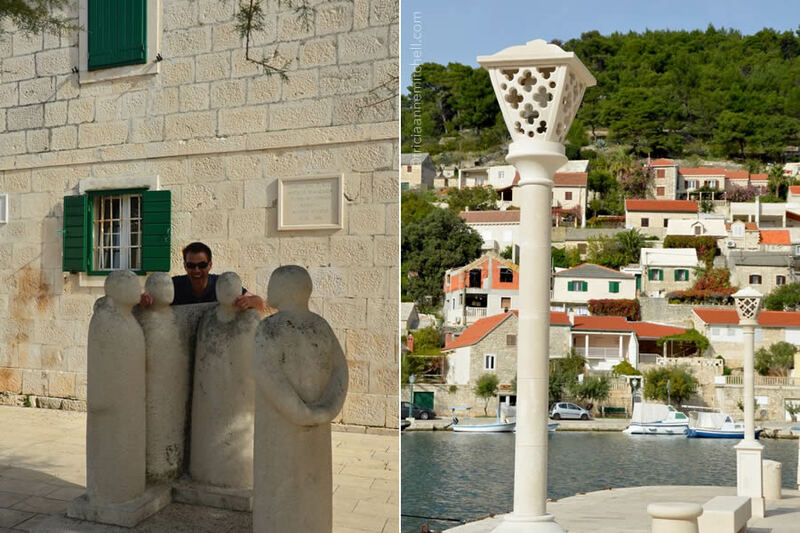 Shawn hams it up with statues of klapa singers (left), and a pair of limestone lampposts. Even in October, the water looked – and felt – inviting. Merchants sell stone souvenirs in the town’s center – everything from bowls, to mortar and pestle sets, and magnets. We were tempted by a mortar and pestle, but couldn’t add any more weight to our luggage, which was already bursting at the seams since we’d just moved from Malta. The town of Pučišća is located on the Croatian island of Brač. For more details about the community, see the Official Tourist Board of Pučišća website. The Stonemason School (Klesarska škola in Croatian) is less than a 5-minute walk from Pučišća’s main bus stop. The address is: Novo Riva 4, 21412, Pučišća, and telephone is: +385 (0)21-633-114. Visitors are welcome, but it’s advisable to check the school’s website (link above, note that the site is in Croatian) to verify ticket prices and ensure the school will be open when you intend to visit. The island of Brač is accessible by ferry or catamaran, and the journey from the city of Split to Brač takes about one hour. 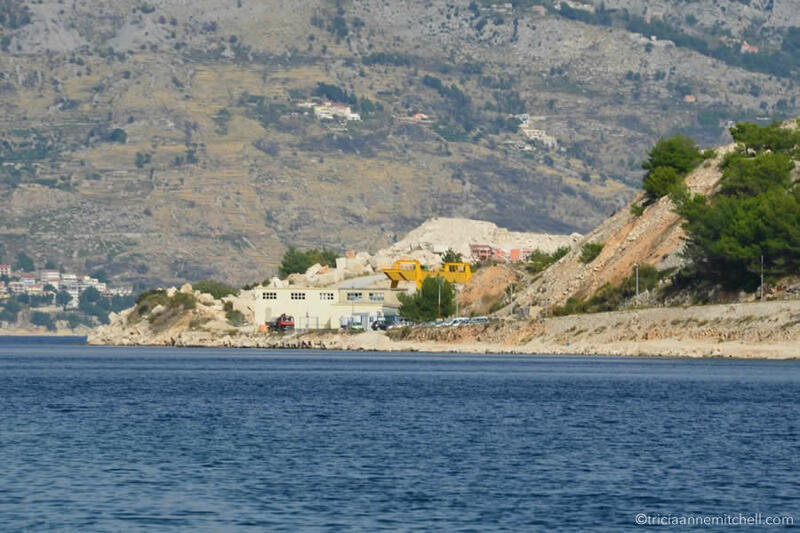 The catamaran goes to the town of Bol, whereas the ferry travels to Supetar. Both vessel types are operated by Jadrolinija, which lists the fares and timetables on its website. When we made the trip in the autumn of 2016, the catamaran fare was 40 kuna one way, per person. Distances on Brač appear deceptively short when you look at a map. However, since Brač’s terrain is rugged and many of the roads are curvy, it takes longer to get around than you might think. If you’re traveling by bus, as we did, use the Autotrans Bus website to plan your journey. We stayed in the town of Bol, about 22 km (13.5 miles) from Pučišća. Our journey from Bol to Pučišća took roughly 35 minutes and cost 30 kuna one way, per person. You can buy the tickets on the bus, or online. We got a better overall price by buying round-trip tickets. 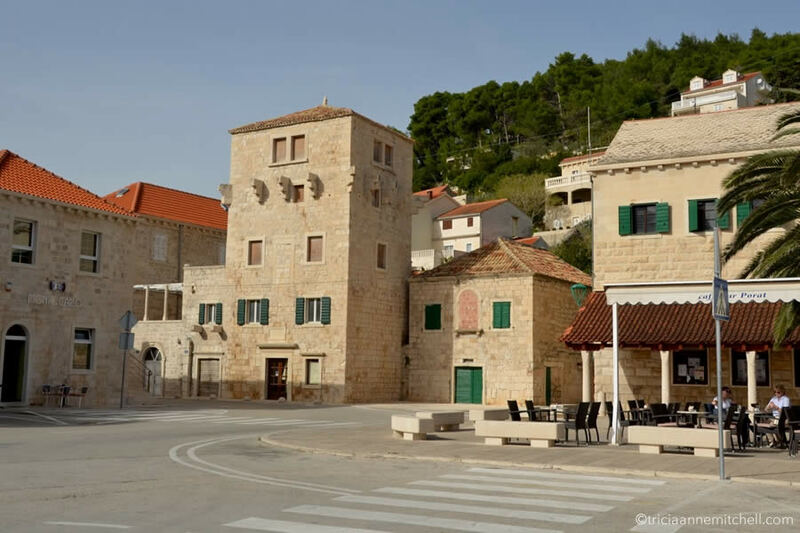 While on Brač, we stayed at the Apartments Milena (affiliate link), in the lovely town of Bol. While it was a bit of a walk from our apartment to Zlatni Rat (Croatia’s most famous beach), grocery stores, cafés, and restaurants, were an even shorter distance. Bol’s main bus stop, as well as the catamaran point, were about 15 minutes away by foot. Milena, the apartment owner, was friendly, brought us homemade cookies, and allowed us to have a late check-out. We didn’t speak a common language, but used Google Translate to converse. Milena and her family also kindly offered for us to use their outdoor oven, which would be great for cooking a traditional peka there. Would you like more ideas as you plan your Croatian adventures? Here’s an index of all my posts from Croatia. Photography & text © Tricia A. Mitchell. All Rights Reserved. My husband, Shawn, crafted the video. I share your respect for this type of dedication to a project, Nurul! I’ve always wanted to be able to do watercolor painting, or simply just sketching, and I guess I’ve never tried for long enough, rather simply concluding that I didn’t have an inborn talent for such types of art. As for visiting schools, I am a former educator, and so I’ve enjoyed visiting elementary schools, high schools, and universities in Croatia, Cambodia, Indonesia, and beyond. My husband, Shawn, has accompanied me on these visits, and we usually leave the classrooms making note of universal traits students display, regardless of where they are in the world. Unlike the more traditional schools we’ve visited, this stonemason school is a tourist attraction in this tiny Croatian town. The day we were there, a group of cyclists traversing this island even stopped in too. Hope you’re enjoying a lovely spring – are you still in Istanbul? What a great place to visit. I have always been intrigued by the work of a stonemason. Nice to see it is not a dying art and that young people are still learning the craft. Great report and pictures as always! Darlene, if you’ve long been intrigued by stonemasonry, you’d likely appreciate Croatia’s ubiquitous stone architecture. In the region of Dalmatia (where this school is), there are heaps of beautiful monuments, buildings, and homes. During this trip, we even got to visit an old quarry where stone was sourced for a Roman emperor’s palace 1,700 years ago. Incredibly, a relief of Hercules, carved into the quarry wall, was still there. Thanks for your kind words, and wish you an enjoyable wrap-up to the weekend. Tricia – How did I miss that you guys moved to the Croatian coast?? In all my travels, I think it is the most beautiful coast! Where are you? 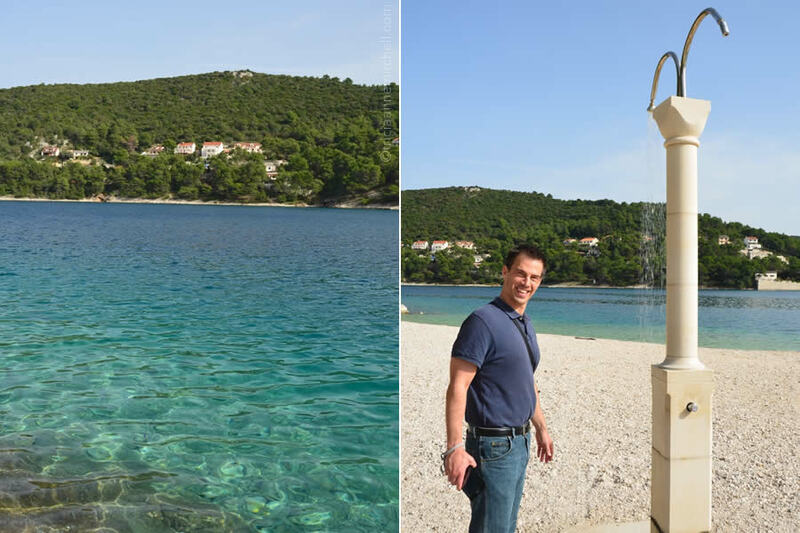 I was in different places in Croatia and Bosnia during the war – and we loved wandering the coastline. AND – I studied sculpture (in Kentucky!) with a protogee of Ivan Mestrovic — Croatia’s most famous sculptor. I look forward to catching up on and following your adventures! Hi Tricia, we haven’t officially moved here, but we’re back in Croatia again, this time in the region of Istria. 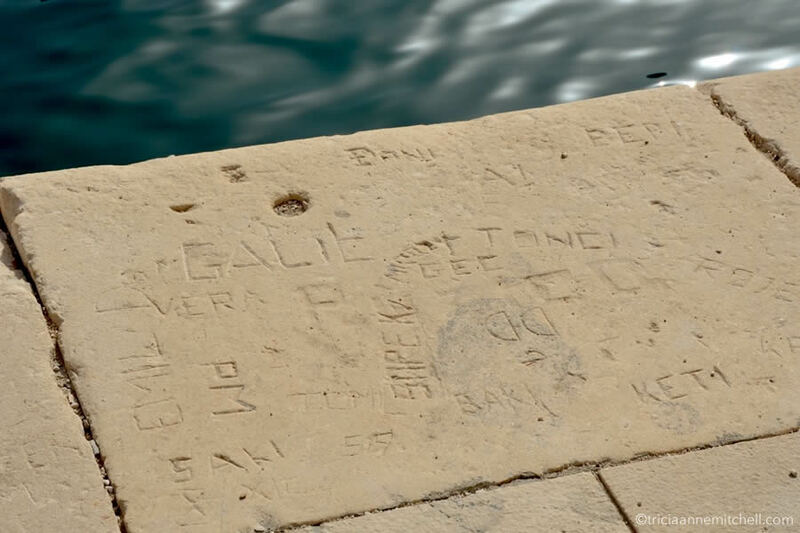 In the past, we’ve made Split and Trogir our bases to explore Dalmatia. I’m with you about Croatia having one of the most beautiful coastlines. When we came back to visit last autumn, after living in Malta where there aren’t many trees, Croatia’s natural beauty nearly brought a tear to my eye. How special that you studied with someone with a connection to Meštrović! When we lived in Split for a few months, we visited Meštrović’s gallery during a Night of the Museums event. Aside from the villa’s gorgeous setting, I still remember his distressing sculpture of Job. The piece was dramatic by itself, but for the special event they added a halo-shaped filament that would glow hot, as well as a heartbeat soundtrack, creating significant tension for the visitors. Have you been back to Croatia or Bosnia since the war? Please feel free to share any spots that were especially memorable for you! Absolutely beautiful Tricia, you documentary images are exquisite to me as a viewer and photographer. What adventure are you both on right now? Cornelia, as they’d say in our current home away from home – hvala lijepa – thanks so much for your high praise! We’re back in Croatia, though this time in the region of Istria. I’ve been quiet these past months, because we’ve been at sea (on the Indian Ocean), and in Thailand and South Africa. More on those adventures later! Any plans to come to Germany in 2017? Looking forward to catching up. 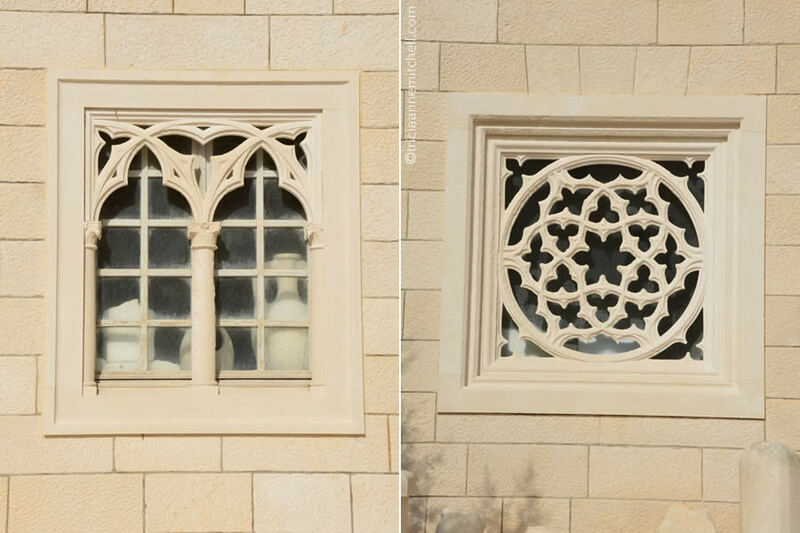 How wonderful to see an actual school for learning the skill and artistry of stone masonry! I agree with your comment about the US needing more skill based schools. I think many educators are quite shortsighted thinking only of college and getting rid of art and music programs in high schools. Many people actually have careers in those fields, as opposed to basketball or football…and we also need more stress on creativity. I see so much skill and artistry in Mexico, starting at a young age. and know how sorely it’s lacking in the US. Thanks for an interesting and enlightening post! Marilyn, happy you enjoyed it! Where I first noticed more skills-based training options was in Germany. German students pursue various tracks at an early age – one offers university preparation, and another can lead to apprenticeships. I’ve heard this practice of having teachers decide which track a child belongs in- at a rather early age – can be controversial too. Critics argue that potential can’t be predicted at such an early age. I’m curious about the artisans in Mexico, since I’ve not spent much time there (Oaxaca is on our wish list!). Are skills taught in families, and handed down from generation to generation, or have you heard of formal training programs? As a person who loves intricate carvings, I wonder if I should learn how to make one. For sure taking photographs of beautiful relief panels is a lot easier than creating them. 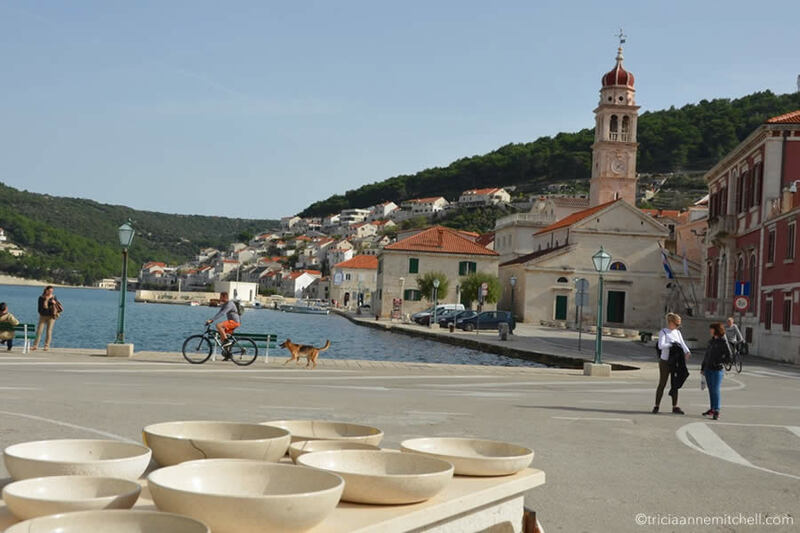 For a place with a population of around 2,000, Pučišća surely punches above its weight! Bama, true that a photographer can have a quicker go creating a shot, than one of these stonemasons does working on a piece for months or more! What’s also neat is that you’ll meet graduates of this school as you explore others parts of Croatia. Just a few days ago, for example, we wandered into a shop 7+ hours’ north from Pučišća, only to discover that the shop owner had studied at this school. I love reading your travel adventures, Tricia! This was so interesting and beautiful! Hello fellow Tricia, and thank you for joining me! Indeed, this is one of my favorite types of excursions. Perhaps we could’ve integrated some watered-down sculpting workshops like this at SAS. :) Hope you’re well. Are you still contemplating a visit to Chiang Mai? Beautiful!p and interesting! Thanks for sharing. It’s fantastic to hear of an old craft being maintained and taught to younger people. I’m not surprised you were tempted to buy, but I know the feeling of having to carry purchases around afterwards. Absolutely, Carol! With youth unemployment pretty high in Croatia, I am curious how many graduates are able to find jobs within Croatia. Either way, it’s uplifting to know skills are being shared with the next generation. It’s always lovely connecting with you, Virginia, if even from afar! Here’s hoping that one of these days we can enjoy a cafe latte together in person. On a side note, being the culinary wizard that you are, do you have any recommendations for a quality mortar and pestle? 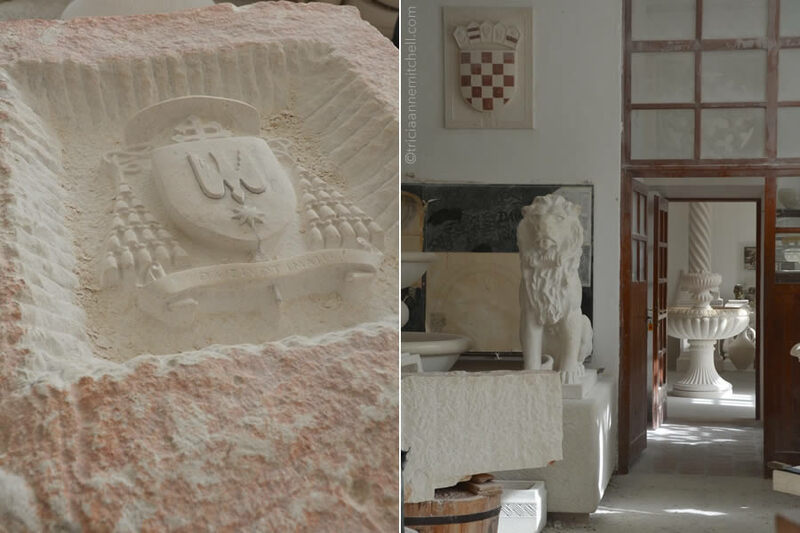 Shawn and I love these Croatian limestone ones, but were wondering which material lends itself well to blending spices and herbs? I’m guessing you have experience with some. More than 3,000 times and it’s still going strong – wow! It sounds like a family heirloom in the making. Perhaps we’ll opt for a marble mortar and pestle then, and instead purchase a non-utilitarian limestone piece. Many thanks for sharing your valuable insight, Virginia. I’m happy you enjoyed it, Jaya!